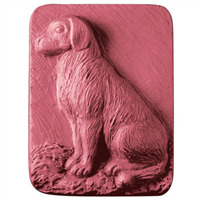 Perfect for kids or dog lovers, our Breakaway Dogs soap mold features six images of adorable pups. 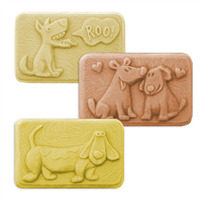 Break them apart for individual soaps or leave them whole for a soapy comic strip of dog antics. Bar Cavities: 4 Bar Depth: .75"
Bar Length: 4.5" Bar Width: 2.25"
COMMENTS: Very cute! Dual usage as they can be cut appart for favor/hand size or kept whole for a cute full bar! 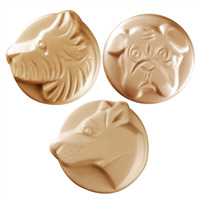 COMMENTS: These little doggy molds are great for my dog soaps......folks just love the adorable dog impressions, I can't make these fast enough! The soap does stick in the molds so make sure to spray them first! They will crack if it is too hard to get them out of the mold..
"I am also confused about these molds. I see six images. Am I getting two of each of the two molds shown? Is that where the 4 comes in?" Staff Answer Yes. Each set of three is one cavity. There are two cavities of each design. Hopefully, this makes it more understandable. "not sure the description matches your "makes" info?" Staff Answer Yes the description and the 'makes' info are both correct. The mold has four total cavities. Two of each of the designs pictured.